Our special transporter can load 20-1000 tons cargo.Whatever the weight and size of the cargo, we can design the most professional transport schemes for you to guarantee the cargo with whole process safety! Our factory belongs to China national group and have started the special transporter manufacture since 1970s, so we have accumulated abundant the special transporter design experience. Our modular trailer can parallel with famous international brands such as GOLDHOFER, NICOLAS, SCHEUERLE and COMETTO. And also we the only one factory that our hydraulic modular trailer can get through the CE certification and have exported to France market! Supro Trailer provide full range of heavy transporters and service for oversea market. Till the end of 2017, Supro Corp. has successfully supplied world-class products and service to over 30 countries and areas around the world, such as: UAE, Poland, South Korea, India, Vietnam, Malaysia, Thailand, Brazil, Chile, Columbia, Kazakhstan, South Africa, Kenya, Sudan, Libya, etc. 1. Establish factory in 1952 year, named "Fushenglai Machinery Co.,Ltd"
2. In 1972 year, changed the name to " Fushenglai Hydraulic Machinery Manufacturing Co.,Ltd"
3. In 2004 year, cooperate with "Power China", and establish an independent department to do the heavy transporter works. 4. In 2012 year, build a company named "China Supro Heavy Transporter Manufacturer Co.,Ltd" to extend overseas market. 1. National factory belong to "Power China". Execute high standard of heavy transporters design and producing. 2. The first manufacturer in China who is able to produce Hydraulic modular trailer since 1952 year also has CE certifiction. Exported to France, Germany, Russian etc. 3. 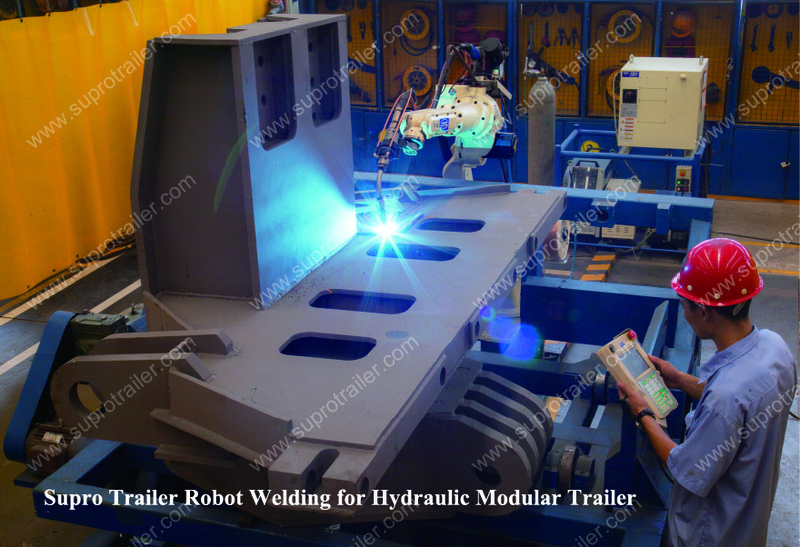 Has advanced producing equipments such as 3D experimental design, Robot Welding and Automatic cutting and bending and sanding equipment. 4. Professional engineer team to provide you the most professional, safty and economic transporter design. 5. Responsible sales team to serve you since our first contacts and provide you the most professional and free transporter consults.